WHAT MAY HAVE HAPPENED: these articles try to answer the questions that arise naturally from the realization that the official story is a deliberate lie. â€œIf not that way, then how . . .?â€ Thermate, an intense incendiary compound, may cut through a massive steel column in seconds; the A3 Skywarrior fits the data available as the aircraft used to attack the Pentagon, from engine to parking lot video, to crash debris. Operation Pearl demonstrates that alternate means of producing a 9/11 exist and are feasible, from hijacking (radar swaps) to air force standown (military exercises), to building collapses (controlled demolition). OTHER ATTACKS: If September 11 was an inside job, what about those subsequent strikes by Al Qaida against â€œwestern civilization?â€ Itâ€™s really quite amazing that during the London attacks of 7-7 an antiterrorism exercise was ongoing. The exercise involved Muslim fanatics carrying bombs aboard subway trains and detonating them at the very stations involved in the actual â€œbombings.â€ Not surprisingly, it turns out that there are many ways to fake a terrorist attack, even a suicide bombing. BACKGROUND INFORMATION: It may help to know that the patterns revealed in the foregoing sections have historical precedents, General Partinâ€™s analysis of the Oklahoma City bombing being a case in point. It also helps to have reliable intelligence about events before, during and after 9/11 as clues to the true nature of the attacks. The idea of news videos of the incoming aircraft being in some manner faked is laid to rest by Eric Salterâ€™s article. 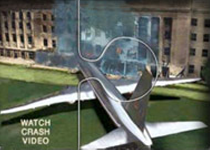 PHOTO/VIDEO GALLERY: Some dramatic footage and stills taken on 9/11 reveal visible problems with the official story. Explosions in the WTC towers well before the aircraft struck, shots of thermite cuts on supporting columns, molten metal running from the building prior to its collapse (!) and other anomalous scenes make this section rather special. COUNTERSPIN COVERAGE: Cracks in the official edifice can be found even in the major media, especially from Europe, where content is not as rigidly controlled. British and American special forces teams in Iraq have been caught twice now with bombs or bomb-making equipment and either wearing or having in their possession, Arab clothing. When did Nick Berg really lose his head and why does the execution chamber have Abu Ghraib decor? In Britain the levels of 9/11 skepticism are much higher than here. EDITORIALS: Opinion and fact mingle in the form of articles by professionals like Bill Christison (former CIA officer) Karen Kwiatkowski (Lt Col. USAF) and Paul Craig Roberts (Washington insider) and a purely technical guy by the name of Ed Mitchell who gives a lively account of jet fuel burning for days at a storage facility where he worked. The tanks were steel, much thinner than the structural steel of the WTC towers. Find out what happened . . .